Massimo Maccarone's 89th-minute goal put Middlesbrough in the Uefa Cup final after another astonishing comeback. Steaua Bucharest led 1-0 from the first leg and extended their lead early on through Nicolae Dica and Dorin Goian. As in the previous round against Basle, Boro were left needing four goals to win but Maccarone's angled drive and Mark Viduka's header gave them hope. Chris Riggott scrambled home a third before Maccarone's header clinched a place in the final against Sevilla. Boro had lost to West Ham in the semi-final of the FA Cup on Sunday - and looked set for more cup heartache here after a terrible start. After 16 minutes Petre Marin was given space to cut inside from the left before firing in a bouncing shot that Brad Jones could only parry - and the rebound fell to Dica, who composed himself before slotting home. Things got worse for Boro on 25 minutes when Goian's header was saved by Jones but Stuart Parnaby's attempted clearance fell for the Romanian defender who buried his shot into the back of the net. 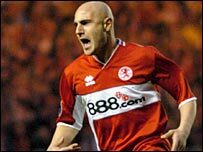 That left Boro a mountain to climb but Maccarone, an early replacement for the injured Gareth Southgate, gave them hope when he latched on to Viduka's fine pass and found the bottom corner of the net. Further chances followed for Viduka and Andrew Taylor before half-time as the home side poured forward. Jimmy Floyd Hasselbaink almost turned in Maccarone's cross after the restart as McClaren's men continued to dominate. Steaua were struggling to get out of their own half by this point but held out until 62 minutes when Viduka rose to head home Stewart Downing's cross. Eight minutes later Boro were level on aggregate when Alberto Carlos pushed Downing's shot into the path of Riggott, who bundled it over the line. Boro were left with 18 minutes to find a winner - and were almost out of time when Maccarone nodded in another Downing cross at the back post to clinch a remarkable win. Steve McClaren's men will face Spanish side Sevilla in the final in Eindhoven on 10 May - their first European final. Middlesbrough: Jones, Riggott, Southgate (Maccarone 26), Queudrue, Parnaby, Rochemback, Boateng, Downing, Taylor (Yakubu 55), Hasselbaink (Ehiogu 90), Viduka. Subs Not Used: Knight, Bates, Cattermole, Parlour. Goals: Maccarone 33, Viduka 64, Riggott 73, Maccarone 89. Steaua Bucharest: Carlos, Ogararu, Ghionea, Goian, Marin, Oprita (Baciu 81), Radoi, Lovin, Bostina (Nesu 86), Dica, Iacob (Balan 65). Subs Not Used: Cernea, Simion, Cristocea, Cristea. Goals: Dica 16, Goian 24.